CD-ROM will become a common peripheral of the PC within five years (1992). (Actual occurrance:1994). DVD will replace VCR and laserdisk as the preferred movie medium once the DVDRAM (recordable DVD's) becomes established within five years (2002). DVD for computers will replace the CD-ROM common peripheral within three years (2000). First consumer DVD recorders came out in 2002 as predicted. High Def DVD and Blue Ray appeared in 2006. DVD or Digital Versatile Discis the next generation storage medium promoted by both the computer and music industry as the eventual replacement for the CD, the CD-ROM and even the laser disk and VHS tape. This format was conceived jointly by Sony-Phillips, the same corporate duo that developed the compact-cassette in the sixties and the Compact Disk in the eighties, as well as the relatively unsuccessful DCC (Digital Compact Cassette). A Sony technician slipped a small disc into the slot of a player no larger than a portable cassette machine. I noticed the record’s shiny surface broke light into rainbow colors. Seconds later I was bathed in rich, wide-ranging stereo music that sounded better than anything I’d ever heard from discs or tapes. Sony Corporation’s Dr. Toshi Doi, a leading digital-systems designer, explained that this was a true digital record: Information stored as number codes on its surface was being converted into music. Instead of grooves, this disc had an optical track “read” by a laser beam. I heard absolutely no surface noise or distortion and no pitch fluctuations from the spinning disc. Dynamic range, or the difference between the loudest and softest musical sounds, was awesome. You can’t buy such a digital audio disc (DAD) now at any price. But players and digital discs will be on the market in 1982-’83 sooner than anticipated. The new DAD technology merges hardware similar to that used for videodiscs IPS, July ‘801 with specially developed digital integrated circuits. Disc players, which can be plugged into any conventional hi-fi system, could cost from $500 to $1,000. Discs, initially, will cost about $15. They have unique advantages-detailed shortly compared with conventional LP records. For more than three years representatives of companies participating in DAD technology have been trying to establish a disc standard. Audio firms want to avoid confusing consumers with incompatible discs and hardware. But recently a council of 51 companies in the field ended its deliberations without establishing a definite DAD standard. Instead, the council leaned heavily toward the Compact Digital Disc system I had seen in Tokyo. This system was originally developed by Philips of Holland. Since its first showings [PS, Oct. '79], Sony and Philips have been working together to improve the system and convince others ”quite successfully” that it should become a world standard. While the Philips-Sony DAD system is based on optical laser technology, Telefunken of West Germany has been demonstrating a different groove-type disc system. A mechanical pickup stylus traces digital information contained in the spiral groove. It now seems unlikely, however, that Telefunken’s system will be accepted as a world standard, or even be offered to the public in the near future. That leaves one other system, based on a grooveless disc that uses a pickup to sense minute changes in disc capacitance. This DAD was developed by JVC as a companion to its VHD (video high density) disc player for TV, slated for marketing early next year. 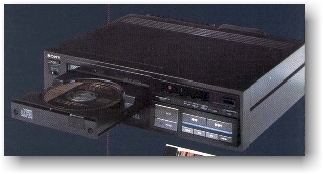 JVC’s audio-disc system uses the videodisc player with an extra plug-in adapter. Music reproduction for these DAD’s begins with a master tape using digital encoding (see box). Recording studios have been using this digital technology for several years. (Some conventional LP records are now called digital discs, but these are simply regular records made from digitally recorded master tapes.) Here’s how this digital music information from a master tape is used for the Philips-Sony DAD. The disc is only 4.75 inches in diameter, but it can store up to one hour of stereo on a single side. Four-channel recordings at reduced playing times are also possible. Digital audio information is stored in the form of microscopic pits in a thin metal layer beneath the clear plastic disc surface. The pits are only about 0.6 micron (millionth of a meter) in width and about 0.2 micron deep. Digital signals from the master tape turn a laser on and off, creating a continuous spiral pattern of these pits for a master disc, which become projections rather than pits on production stamping discs. For an hour-long disc, the track of pits and flat, highly reflective area between them is some 2.5 miles long. This track is made up of six billion bitsâ€”the ones and zeros of binary language. It is read from the disc by a laser beam focused many times finer than a human hair. The beam is produced by a tiny solid-state laser. Light reflected from the flat areas between the pits is detected by a light-sensitive diode. Other circuits then convert these light flashes into music. Since there’s no physical contact between the laser beam and the disc surface, no matter how many times you play a disc there’s no record wear. Also, the transparent plastic coating of the disc makes it immune to dust, most smudges, and rough handling. That’s because the laser penetrates minor imperfections on the outer plastic coating. Actually, each side of a Philips-Sony disc has a storage capacity of over eight billion bits. This is more capacity than 60 minutes of sound requires, so the added digital storage space offers fascinating new possibilities for hi-fi recordings. Some of the extra two-billion-odd bits, for example, can store detailed information about the music tracksâ€”length, sequence, title, or perhaps the text of selections. This added information might be displayed on an alphanumeric display on the player, or other models could put it on a TV monitor. The sonic impact of music from a digital disc player must be heard to be appreciated. But the specifications for the prototype Dr. Doi demonstrated for me at Sony help explain why the sound is so impressive. For one thing, the frequency response is ruler-flat from 20 Hz to 20,000 Hz. Also, there is no measureable wow or flutter and no audible rumble. The signal-to-noise ratio, dynamic range, and even stereo channel separation are all in excess of 90 dB. By contrast, carefully pressed analog LP records seldom have noise and dynamic-range specifications above 60 dB, and channel separation of 35 dB is available only with superior phono cartridges. Harmonic distortion from the digital discs is less than 0.05 percent, compared with pickup distortion on vinyl LP’s that’s rarely less than one percent. These remarkable performance figures are obtained with a Sony or Philips player that’s constantly changing the speed at which discs spin. Unlike today’s constant-speed record players, the compact DAD is laser-scanned at 500 rpm near the inner circumference, gradually slowing down to about 200 rpm near the outer disc circumference. This variable rotation rate keeps the linear speed along the digital tracks constant at about 1.2 meters per second. It worked flawlessly, but had little in the way of features (at least compared to the players of today). At the time, only a handful of CD's were available and they sold for around twenty to twenty-five bucks. What was truly remarkable was the sound quality Iwitnessed on the digitally recorded classical Telarc CD that featured COPLAND: Fanfare, Rodeo & Appalachian Spring: the drums pounding even through my humble speakers sounded so realistic. I still have one of the first SONY/CBS CD produced for the medium, Billy Joel's 52'nd Street. Well, I quickly told friends and relatives of my discovery and relished in demos of my new toy. Surprisingly, many thought my purchase and divergence to be dubious and perhaps hasty (not to mention frivolous). Some pointed out 8-track tape and quadraphonic records as parallel possibilities. But I stood my ground and intuitively knew this medium would storm the industry, so much so that I made a prediction that within five years, the CD would stock 50% of the inventory of record stores and departments! History shows I was just a tad too conservative, because by 1986, records and LP's were in the minority at these places and by the end of the decade you were hard-pressed (no pun intended) to locate records at all. Today the music CD is as ubiquitous as the record was fifteen years ago. Back to 1984 and forward: I was hooked. Eventually CD's were coded with 3 letters, like DDD or ADD, which informed the consumer as to how the CD was recorded or pressed. Before long, Ihad begun a 12 year quest to replace my vinyl and now have over 300 CD's, and have purchased/owned five new players since then, two of boom box genre, and one in my 1994 car (factory installed). I still have my original Sony CDP-101. I wonder if it is a collector's item? Another byproduct of the CD revolution (along with MTV), was the revitalization of the music industry as a whole which has benefited enormously. In 1985 having already jumped upon the CD craze, I read about using a CD player and CD as a peripheral for static storage on a computer. This was using existing technology but different storage standards and requirements. CD-ROM or CD - Read Only Memory promised over 600 MB of storage that a computer could access. The possibilities were endless. In 1986 Ibought CD-ROM: The New Papyrus, published by Microsoft. In 1987, I ventured out again and bought my first CD-ROM, an Amdek (Hitachi) from Sears for over $900! Once connected to my computer I could now buy new disks like Microsoft Bookshelf (no longer available today) or Microsoft's Programmer Reference (which included all of the documentation for most all Microsoft developer software) and now known as the Microsoft Developer Library. What was really remarkable about having virtual books on CD was the search/find and bookmark capabilities; I also could cut and paste snippets of source code! This capability mirrored the Windows help design and foreshadowed the World Wide Web. Well, I felt the CD-ROM would proliferate much faster than CD, but this time I was too optimistic. It's taken almost ten years for the CD-ROM to become an expected and required peripheral, but the implications are remarkable: computer games and multimedia both fostered and benefited from the CD-ROM and today it is replacing floppy disks as the preferred distribution medium for software installation. As the speed of CD-ROM has approached over 8 times, improving performance, the music CD has remained relatively unchanged. But as with many technologies, there seems to be built-in obsolescence. You cannot record (prior to 1996) on CD's (at least not the average consumer), and storage breakpoints have reached saturation (600MB is relatively small), since new applications - both computer and video are vying for more space and are gluttons for gigabits: Enter DVD! DVD has remarkable features which practically guarantee success: MPEG 2 video, over 4 GB of storage (17 GB max) and the future compatibility with recordable DVD a.k.a DVD-RAM. Once the DVD-RAM (recordable_ players and software becomes available, we should see steady replacement of current video formats including laser disk and videotape (VHS), with a slower replacement of the current generation of music Compact Disks which DVD is backward compatible with. In the PC/computer arena, the first generation CD-ROMswill experience a similar fate into the next century. However, the DVD-RAM, may be incompatible with the first DVD units available. I recently witnessed my first demonstration of a DVD system at a local consumer electronics store. The Panasonic DVD-100/300 series playing a demo version of "Twister" was unimpressive compared to Laser Disk quality, but an obviously digitally recorded video tape reproduced on a DVD disk was remarkable. Finally, I have just purchased the Pioneer DVL-700, a DVD/LD/CD combo player. I now have both Twiste rand Blade Runnerwhich I bought at the only place in Orlando that sells/rents DVDs (also laser disks) ,LASERIFIC. I now have roughly 75 DVD's in my collection, and bought a new tuner/amplifier, AC3 (Dolby-Digital 5.1), the Sony STR-DE915 (see at left), several new Bose 701 speakers, so I can enjoy the full 5 channel surround sound we all experience in theatres. 2000 Update: I now have over 100 and DVD's now rule! They have by-passed laser disks and are catching up with VHS. Today all major film producers are releasing new and old movies and you can rent them at BlockBuster. Players can now be had for under $300. Most DVDs sell for around $19.95 but can vary from $14.99-27.99 depending on studio and features. 2001 Update: I now have almost 125 DVD movies - you can check my entire DVD collection as listed at my DVD Profile website DVD Profiler is both an online/offline database that provides a great way to track what DVD's you own or would like to buy. Check it DVD Profiler out at InterVocative Software. You can download a free version as well as Premium edition for $25.00. This is one of the best applications I have seen in a long time and my only wish is that there was a CD Collection version! The new DVD format became the fastest growing consumer format product of all time! Last year, my Sony STR-DE915 as mentioned above died (it had a tendency to run hot).I now own a new Sony STR-DE945 which boasts DTS (the DE915 did not have), 110 watts per channel, an LCD remote and overall better performance. With the Klipsch KSW-10 Sub-woofer I got, the bass finally comes through in all it's glory: this is what the .1 in 5.1 stands for (the sixth speaker). The system with some DVD's really gets the walls shaking! SACD Audio from Sony, a competitor to DVD-Audio debuted in late 1999. In 2002 I obtained a reasonably priced second generation model, the DVP-NS500V. In addition to 5.1-channel SACD playback, the player also provides decoding for Dolby Digital and DTS (through its 5.1 analog out). SACD comes in several formats. 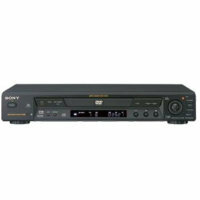 Traditional stereo, 5.1 multi-channel, and a hybrid of those and CD compatible, meaning the disk can play on a regular CD. Although not as many releases as DVD-Audio are available, Sony/Columbia and a few other labels are contributing to a growing catalog of SACD releases. In fact in March of 2003, EMI will release a hybrid SACD of Pink Floyd's Dark Side of the Moon. Releases of the entire Rolling Stones and the Police catalog have come out as well. In fact, you can play most if not all of the DVD-Audio discs on any SACD player and you will get the DTS/Dolby Digital version in all its glory. Of course you would need a DVD-audio player to get the full resolution. However, you cannot play a SACD disk on a DVD-audio player unless it is the hybrid format, which is plays just the CD version. A hybrid that would play both DVD-audio and SACD would be the ultimate player, but they run close to $1000 in 2003. Perhaps when come down below $300, I will get one. High Definition DVD's are the next evolutionary step for the DVD platform and two major formats/implementations are vying for dominance: HD-DVD and Blue-Ray Disc. An HD-DVD player from Toshiba should be available for around $500 in March 2006. DualDisc is a relatively new hybrid CD/DVD format that has come out in the last few years. This is a competitor to SACD by major record companies and has been more successful. In most cases a DualDisc consists of a regular CD on one side, and a DVD audio and/or video on the other side providing added value releases. In 2003 I mentioned that I would not buy a hybrid DVD-A/SACD player unless the price was reasonable. The Sony SACD I had no longer played the SACD's with the 6 channel sound so I decided to look into getting a replacement that would also replace my aging Panasonic DVD-A player. I found the DenonDVD-1930I for around $350 which was pretty reasonable. And the player does an admirable job at playing both formats. DVD Info a comprehensive site worth looking at with just about everything you would want to know. alt.video.dvd FAQ a Frequently Asked Questions page on DVD. Also diehard DVD fans should frequent the USNET group alt.video.dvd.